The Local Technical Agroclimatic Committees (LTACs) are an innovative initiative with the goal of integrate stakeholders from the agricultural sector at the local level to inform smallholder farmers, about the expected changes in the climate of their region, about how they can affect their crops and what they can do to reduce negative impacts. Moving one or two weeks to the date of sowing can mean that a crop has an outstanding yield, or can avoid losses that seemed imminent. This recommendation comes from an agroclimatic forecast that warns that it is highly likely that the rains will be delayed for at least a week. By moving the planting date, the soil will be more suitable and the crop will be able to receive the amount of water and solar radiation it requires. Climate-smart practices are only one of the valuable inputs provided monthly by the LTACs, implemented by CCAFS, and coordinated at the local level by key partners, carrying out these meetings in different departments of Colombia. The meetings include the Ministry of Agriculture and Rural Development (MADR), departmental secretariats of agriculture, guilds, regional environmental authorities, universities, producer associations, municipal technical assistance units (UMATA), research centers, among others, to integrate knowledge and actions on climate-smart agriculture, targeting especially the most vulnerable farmers. 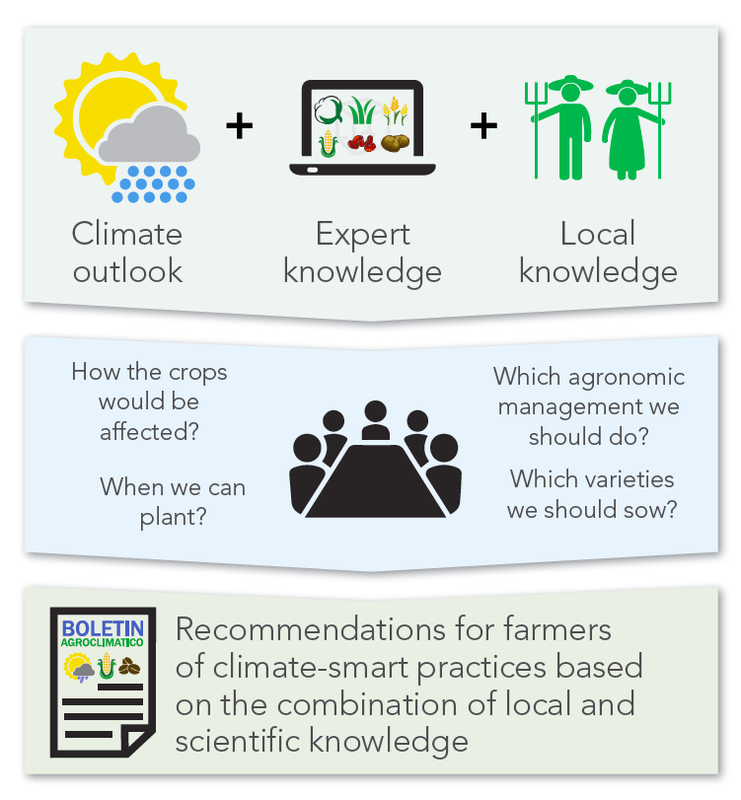 LTACs allow the discussions between these stakeholders for the management of local agroclimatic information, in order to identify best practices for adaptation to climatic phenomena, which are then transferred to local technicians and producers through the Local Agroclimatic Bulletin. This newsletter summarizes the seasonal predictions and climate forecasts analyzed at the LTAC, along with recommendations and climate-smart practices by crop type. Córdoba: Valle Medio del Río Sinú: Cerete, Ciénaga de Oro, Cotorra, Montería, Chima y San Pelayo. Sucre: Mojana Sucreña: Majagual, San Benito Abad, San Marcos, Caimito, y La Unión. Cauca: Subcuenca del Río Las Piedras: Polindara, Puracé y Popayán. Magdalena: Aracataca, Pueblo Viejo, Zona Bananera y Ciénaga. During each meeting, experts in agrometeorology share the agroclimatic forecasts, made from the analysis of seasonal predictions for the region, and crop models. Subsequently, the participants in the committee meet in groups and analyze how crops would be affected, based on the forecasts presented and their own experience to make recommendations that facilitate decision-making on topics such as: what seed to use, more favorable dates for sowing according to the soil moisture accumulated both in the sowing and throughout the cycle, irrigation management, cropping, soil and insect-pests or diseases according to the climatic conditions foreseen for the following months. LTACs are also spaces that bring together stakeholders to discuss issues related to agricultural activity and climate, and serve as vehicles for coordinating activities between institutions. The LTAC approach also seeks to strengthen participants' capacities by conducting workshops on agroclimatic modeling tools and empowering members of the committee to appropriate it by alternating roles and tasks among participating organizations. 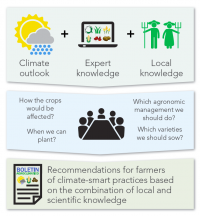 Each region faces different challenges in terms of climate and priority crops, which is why LTACs promote intersectoral dialogue between stakeholders, and bring seasonal forecasts of the national scale to the local scale, to make better decisions about their crops. In the bulletin we were recommended to plant corn in the second part of the month, instead of the first. We shared this with the producers and those who took the recommendation showed a more vigorous development of the crop compared to those who did not comply with the recommendation." 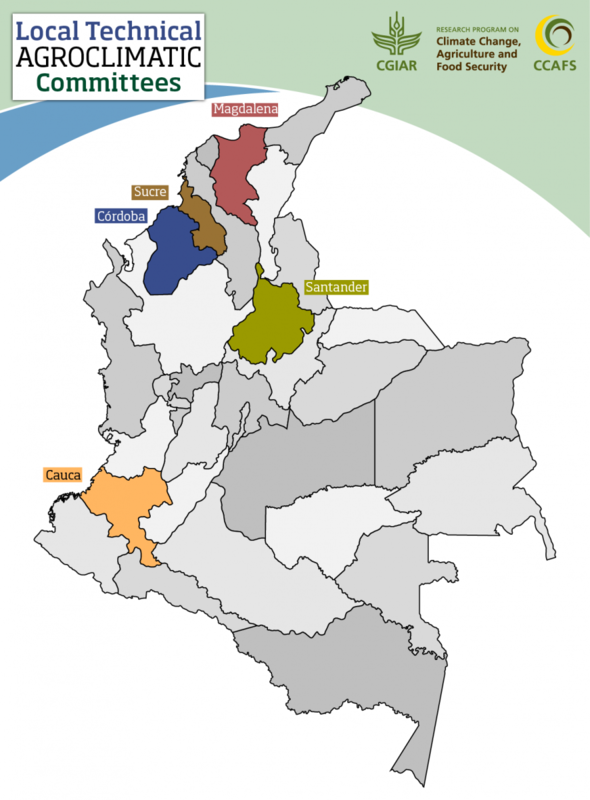 The LTACs have been so successful that, after establishing the first committees in the Colombian departments of Córdoba and Cauca at the end of 2014, the committees of Sucre and Magdalena were created in 2015 and Santander in 2016. The goal is to reach fifteen LTACs throughout the Colombian territory, with forecasts and recommendations that will benefit nearly one million farmers, as stated in the national determined contributions (NDCs) presented by the Government of Colombia to the United Nations Framework Convention on Climate Change (UNFCCC). 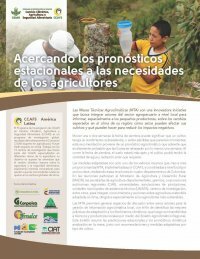 The "Local Technical Agroclimatic Committees" initiative is part of the CCAFS portfolio in Latin America.